One Million Moms, a group known for its protests and boycotts, published a petition on their website Tuesday saying the commercial is way too heavy on sexual innuendos and far too light on chocolaty goodness. “Work It” dropped in 2002 but has remained a hit throughout the years. It even got a surge in popularity last fall when Mary Halsey, who deemed herself “Missy’s funky white sister,” went viral doing the song at a karaoke barbecue. Missy and Mary even teamed up on Ellen to put their thing down, flip it, and reverse it. 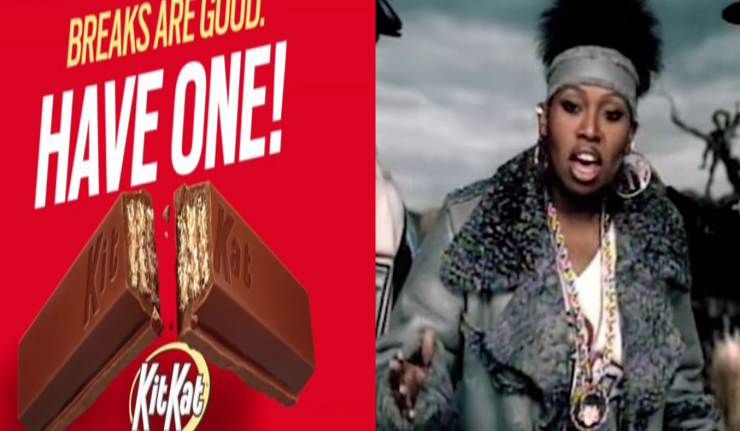 With renewed energy around the song, it may make sense that Kit Kat wanted to trade out their classic “Break me off a piece of that Kit Kat bar” jingle for “Ti esrever dna ti pilf, nwod gniht ym tup.” Even before One Million Moms got into the fight, however, people were scratching their heads over the marketing decision. After Kit Kat posted the commercial on their YouTube page, fans had some thoughts that echo the concerns of One Million Moms. The 15-second commercial does primarily focus on the song with images of the candy bar being flipped before the slogan “Breaks Are Good. Have One! pops up at the end. One Million Moms closes their petition with a direct message for the Nestle-owned company. Despite the 1,000,000 name, the petition currently has only 8,730 signatures. Maybe 991,270 moms are taking a break.